Female entered the nest box at 6:32AM At 6:53AM she gave a loud, monotonic trill. For the next hour, she was alternating between head-out and down in the box. The approach of one squirrel made her jump into the entrance (to block it?). During head-out periods we occasionally hear single “clucks”, rather high and sustained, but trailing off in pitch. 6:14PM, Female has her head out the entrance; one soft monotonic trill. 6:35PM. Female flew north from the nest box. 6:41 Male appeared in Birdfeeder Tree, then left. Female appeared in Canoe Tree a minute later, then flew through the Gap to Crepe Myrtle. At 6:44pm, male appeared, jumped on top of female, a few seconds of wing-flapping, chittering, and who knows what else ensued. 6:46pm, both owls flew north into Klein’s yard. Did they catch something and head to a plucking/eating perch in Klein’s yard? 6:54, owl on the Birdfeeder Branch. 7:00pm, Female in the Thistlefeeder Tree, off our back deck, until 7:15pm. At 7:22pm, she was on the lower, Orchid Branch. Is she sneaking up on a bath in the dish? 7:30pm She’s bathing in the dish of water on the back deck, and stayed in for almost 3 minutes. Soaking that rear end before egg laying (?!?). Female was inside the nest box when I checked at 7:35am. Neither Connie nor I were around to see just when she entered. 6:14PM, F as her head out the door; one soft monotonic trill. 6:34PM, Female flew north from the nest box, having spent all day inside. 6:39pm, Female was back on the external perch of the nest box, with the male owl. One or the other (I guess the female) is giving the clucking “box call”. No, revise that: at 6:41pm female briefly entered box, and I think the owl on the perch was still giving the box call. Female left box again after less than 30 seconds. At 6:45pm, both owls appeared in the Birdfeeder Tree and Canoe Tree, north of the house. 4:45, Female in Canoe Tree. 5:45AM, Owl on the external perch of nest box. 6:10AM Both owls on Honda Branch. Female entered the nest box at 7:19AM. Some bluejays must have seen her making the flight, because she arrived just ahead of a squawk from a jay. She sat, head out, until 7:40am, and then settled onto the bottom of the box. PM T= 52F, overcast, blustery wind. 6:32pm, Female flew north from the nest box, having spent all day inside. We thought we heard her trilling, possibly from east of shop. 6:41pm, Male appeared in Canoe Tree, and pooped thunderously onto the aluminum canoe. He trilled softly, then flew at 6:42pm down driveway to Crepe Myrtle, where he was met by female. She continued to sit in Crepe Myrtle, scanning Evan’s front yard, while he moved farther south, possibly to the Computer Oak. What will they be hunting on such a windy night? 5:45AM, owl at the nest box external perch. 6:24AM Female flew to the Canoe Tree back yard perch W of shop and at 6:26 flew north toward day roost (liveoak) tree. There is still time yet for her to change her mind. If she has an egg coming she will need a place to put it, regardless of squirrels. She entered the nest box at 7:05AM, and spent a quiet day inside, leaving around 3 PM to perhaps bask in the sunshine east of the shop. PM T= 54F. 6:41PM Female and male owls flew from the north to the Birdfeeder Tree. One owl trilled, male jumped on top of female, and a second of wing flapping, chittering, and who knows what else ensued. Female flew SE through Gap, up to external perch on the nest box. Male flew down the driveway to high hackberry over trash can. Female joined male on hackberry branch for a half minute, then returned to nest box at 6:47pm. After 30 seconds on the external perch, female entered nest box and spent a minute on the floor, fluffing the shavings. 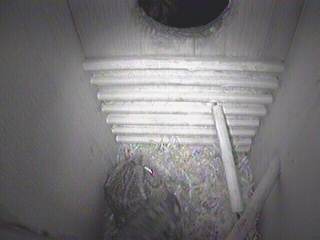 This was the first time we have seen the female enter the nest box at this time of day; time for evening hunting. She left at 6:48, returning to the high hackberry branch over the trash can, where she sat patiently, as if waiting for her mate to bring her something good to eat. At 7:04pm, the male rejoined her on the hackberry branch, and they mated again. 8:40pm, female is again on her loafing spot (hackberry over the trash can), sitting motionless. Guess I better turn down the volume on my dishwashing music: Johnny Hiland’s wailing electric guitar probably really makes it hard to hear tiny snakes crawling under the leaves. Female still on hackberry branch at 9:15pm. Saw no owls this morning. The nest box was empty all day (no owl, no squirrels). PM 49F. Limited time for observation, but at 6:53PM the female owl was perched on the external perch of the box. She stuck head and shoulders into the box for an inspection, and, we hope, was encouraged by the absence of squirrels. She left after less than a minute. 6:36AM Both owls come from E of shop, one to the boy box, one to the nest box perch; first one, then the other flew N, to roost. No one in the box as of 7:05. Turned the internet cam off. 2:30PM, got home to find the F in the box! So turned the cam on again. 6:26PM, F left the box for the thicket E of the shop. No one came to the back yard, no one on the driveway. 7:15PM, trilling and chucking from an owl on the nestbox perch. Could even be two owls. One owl zoomed to the driveway branch and on down the driveway. Saw nothing else. AM Slept late, recovering from hospital time yesterday. Saw no owls in AM. PM: T= 56F, clearing, sort of humid. I thought I saw owls shifting about in the northern liveoak roost in Klein’s around 6:35PM. At 6:41PM, female flew from north into small hackberry east of the Birdfeeder Tree, and pooped thunderously onto the overturned aluminum canoe beneath this tree. At 6:47 she flew back north into Klein’s. We watched until 7pm without seeing any more owls in backyard or driveway. 6:30AM Connie saw female owl bathing . 6:37PM, F arrived in the tree outside the shop door. Within 2 min the M arrive, startling the F into flight, which startled the M, who dislodged a small branch which hit the overturned canoe below with resounding effect. Eventually they both returned; F flew up to the roof gutter, T says for a sip of water. Exited N.
6:50pm, F came to the Thistle feeder branch, then to the water dish. It was quite dark and we couldn’t see clearly. She seemed to sit there, not splashing; perhaps just enjoying a wet, cool bottom. 6:33am, F goes to the box and quietly clucks in series. 6:55am, back at the box, inside, head out the entrance. This was the female’s fourth day in the nest box, although in the afternoon a squirrel had replaced her. We did not see the interaction (if any), so don’t know if squirrel chased her out, or if she just left and squirrel entered empty box. 2pm, returned home to find a squirrel in the box! Used the Magic Fingers to chase it out. PM. T= 58, overcast At 6:15 PM, squirrel tried to enter the box, and was chased off by Magic Fingers. At 6:35PM, male owl appeared on high hackberry just east of the Birdfeeder Tree, and trilled twice. The female then joined him, flying from the north. He jumped on top of her, and a second of wing-flapping, chittering, and who knows what else ensued. At 6:37PM, she flew through the Gap to the Stub Perch. He followed a minute later and flew down the driveway to the Crepe Myrtle, to hunt over Evan’s front yard. She followed to a high hackberry over the Driveway. She then flew to the Burr Oak, and he flew across the street to the Art Park, at about 6:40 PM. Female spent third day roosting in nest box ( did not roost there yesterday, however). PM. T= 54, clear and calm. At 6:01PM, a squirrel got on the outside perch to the nest box. Madame Owl hurled herself in the entrance and barred the door. MY BOX ! At 6:31PM, she flew from the nest box, heading east of the shop. At this point, I shifted my position to the shop steps. At 6:34PM, she appeared on the hackberry next to the Birdfeeder Tree , followed a minute later by the male. (Aside: the time of Civil Twilight tonight is 6:35PM). She (I think it was she) flew through the Gap, and landed on the external perch of the nest box. After a minute, she flew back and rejoined the male in the Birdfeeder tree. They shifted position a few times, fluffed, and he (I think it was he) flew through the Gap into the ligustrum by Grady’s window. I thought I heard a few sounds from that direction. While I was watching in the driveway direction, there was a sound in the leaves behind me (by the Birdfeeder fence), which could have been hunting strike, and when I turned cautiously back to check, I only saw an owl (female, I think) winging north into Kleins.